Basic information relationships characterizing the representation of a continuous signal by the finite set of its instantaneous values in the signal space built on the generalized Boolean algebra with measure have been derived. In addition, peculiarities of the formulation of the sampling theorem for stationary random processes (signals) were also considered. V. A. Kotel’nikov, “On the capacity of the “air” and wire in telecommunications,” in Sb. Vsesoyuznyi energeticheskii komitet. Materialy k I Vsesoyuz. s’ezdu po voprosam tekhnicheskoi rekonstruktsii dela svyazi i razvitiya slabotochnoi promyshlennosti (Upravlenie svyazi RKKA, Moscow, 1933), pp. 1–19. J. M. Whittaker, “Interpolatory Function Theory,” Cambridge Tracts in Mathematics and Math. Physics, No. 33, Ch. 4 (Cambr. Univ. Press, 1935). C. Shannon, “Communications in the Presence of Noise,” Information Theory and Cybernetics (Izdat. Inostr. Lit., Moscow, 1963) [in Russian]. 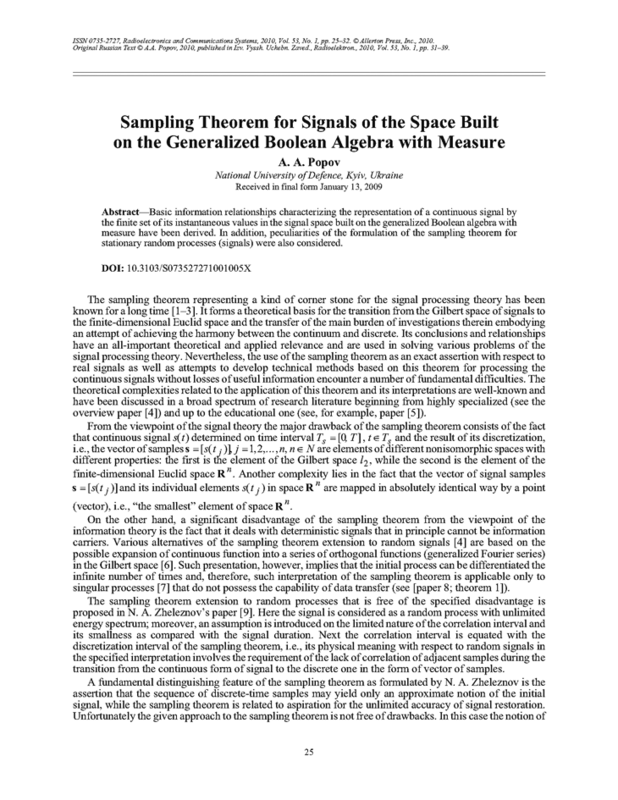 A. J. Jerri, “The Shannon sampling theorem, its various extensions and applications: Review,” TIIER 65, No. 11, 53 (1977). V. I. Dmitriev, Applied Information Theory (Vyssh. Shkola, Moscow, 1989) [in Russian]. W. B. Davenport and V. L. Root, An Introduction to the Theory of Random Signals and Noises (McGraw-Hill, New York, 1958; Izdat. Inostr. Lit., Moscow, 1960). V. I. Tikhonov, Statistical Radio Engineering (Radio i Svyaz’, Moscow, 1982) [in Russian]. A. A. Popov, “Information characteristics and properties of a random signal considered as a sub algebra of a generalized algebra with a measure,” Izv. Vyssh. Uchebn. Zaved., Radioelektron. 51(11), 57 (2008) [Radioelectron. Commun. Syst. 51(11), 615 (2008)]. N. A. Zheleznov, Specific Problems of the Theory of Information Electric Systems (LKVVIA, Leningrad, 1960) [in Russian]. J. C. Oxtoby, Measure and Category, 2nd ed. (Springer-Verlag, New York, 1980; Mir, Moscow, 1974). V. A. Artamonov, V. N. Salii, L. A. Skornyakov, et al., Universal Algebra, Vol. 2 (Nauka, Moscow, 1991) [in Russian, ed. by L. A. Skornyakov]. D. A. Vladimirov, Boolean Algebras (Nauka, Moscow, 1969) [in Russian]. R. Sikorskii, Boolean Algebras (Mir, Moscow, 1969) [in Russian]. V. A. Artamonov, V. N. Salii, L. A. Skornyakov, et al., Universal Algebra, Vol. 1 (Nauka, Moscow, 1991) [in Russian, ed. by L. A. Skornyakov].